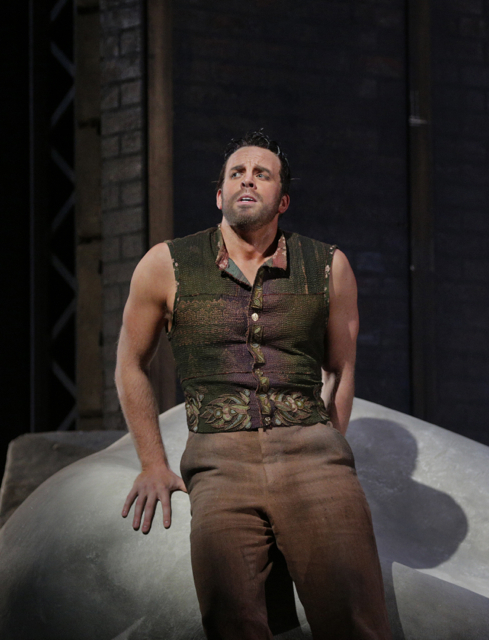 ERIC CUTLER (NADIR) & CHRISTOPHER MAGIERA (ZURGA) & CHORUS. Photo by Ken Howard. Note the actual sunset and rain clouds over the New Mexican Jimez Mountains at the back. Now playing in summer repertory. Review by David Gregson of the August 10 performance. Because I regard Opera West as a more or less informal blog rather than a site to publish a standard formal opera review of the type one might read in the New York Times, I very often take the liberty of discussing my own personal experiences with regard to the subject at hand. So I’ll begin by saying, several years ago I spent a month hospitalized in Sri Lanka, once known as Ceylon. There was hardly a day in my old British colonial-style nursing home that I did not, in a sort of quiet irony, hum to myself a tune from Bizet’s “The Pearl Fishers.” Security at the home was lax, and when I felt better, I and some other patients would occasionally escape and explore parts of Columbo and even the Kingdom of Kandy, all the while whistling bits of the opera. At the time I was blissfully unaware that Bizet and his librettists, Eugene Cormon and Michele Carré, had originally set their opera in Mexico and only moved the action to Ceylon when the Mexican political situation vis-à-vis the actions of Napoleon III had become volatile. NICOLE CABELL (LEILA). Photo by Ken Howard. I can say from what I saw with my own eyes in Sri Lanka and from what I studied about its past, the island’s real life is far, far removed from what we find in “The Pearl Fishers,” but I will totally refrain from evoking the spirit of Edward Said who might possibly condemn this piece as just another racially prejudiced and inaccurate 19th-century European colonialist portrayal of the “exotic East.” I am certain all cultures have unfairly judged or falsely romanticized views of one another. 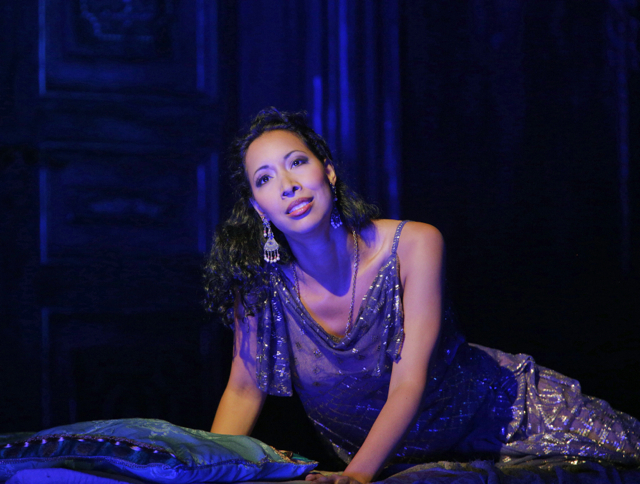 Any intelligent person can tell “The Pearl Fishers” is a charming opera with a rather standard love-triangle plot set in a fantasy version of Ceylon. Two guys, best friends — and both in love with a virgin priestess. The tenor gets the girl, but only through the baritone’s self sacrifice. This is an opera, not an anthropological treatise. A noted radio personality on KUSC FM once featured “The Pearl Fishers” as an example of an opera in which there is only one good aria (a duet) and in which all the rest of the music is trash. He had quite a list of such operas (including “Rusalka” and “Die Tote Stadt,” as I recall). However, the opera has several wonderful numbers, not just the tenor-baritone duet, “Au fond du temple saint,” cited by the radio host, but Nadir’s dreamy song sustained in beauty by notable head tones, “Je cross entendre encore”; the priestess Leila’s cavatina, ” Comme autrefois dans le nuit sombre”; and Zurga’s song “O Nadir, tender ami.” The “big tune” associated with the friendship of the men and of Leila, “Oui, c’est elle, c’est la déesse” recurs more than once, and much of the rest of the score has a light attractiveness one might expect in an operetta. It’s early Bizet, not a masterpiece through and through — but it has many more than one highlight. CHRISTOPHER MAGIERA (ZURGA). Photo by Ken Howard. 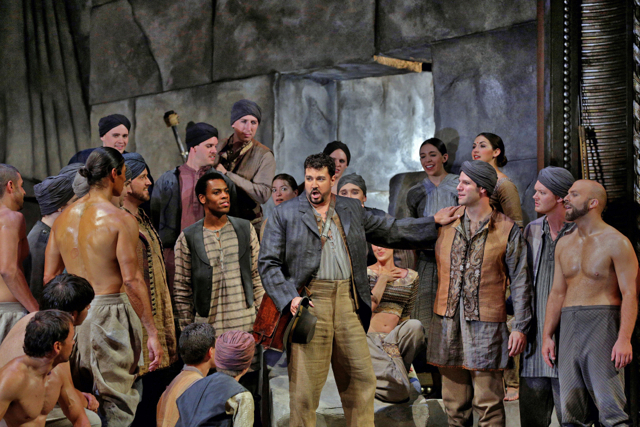 Beautifully conducted by Emmanuel Villaume, wonderfully played by the Santa Fe Opera orchestra, and with excellent choral work led by Susanne Sheston, this “Les pêcheurs de perles” was imaginatively staged by Lee Blakeley who, with the help of set and costume designers Jean-Marc Puissant and Brigitte Reiffenstuel, placed the action in the time frame of the opera’s actual composition. The irresistible soon-not-to-be virgin priestess of Brahma, was gorgeously impersonated by soprano Nicole Cabell, although on the night I heard her, she seemed thin and watery vocally until the first long passages of recitative came along. Looking very macho without his shirt on, baritone Christopher Magiera as Zurga did not catch vocal fire until Act Three. Until then, his voice was dwarfed by everybody else’s, and the famous duet sounded lopsided. Tenor Eric Cutler as Nadir turned in the most successful performance of the evening, although I imagine his delicately nuanced “Je crois tendre” has sounded better on other occasions. Basso Wayne Tiggs was imposing vocally as the High Priest of Brahma. From this point on I will simply let the photos do the talking. ERIC CUTLER (NADIR) & CHORUS. Photo by Ken Howard. 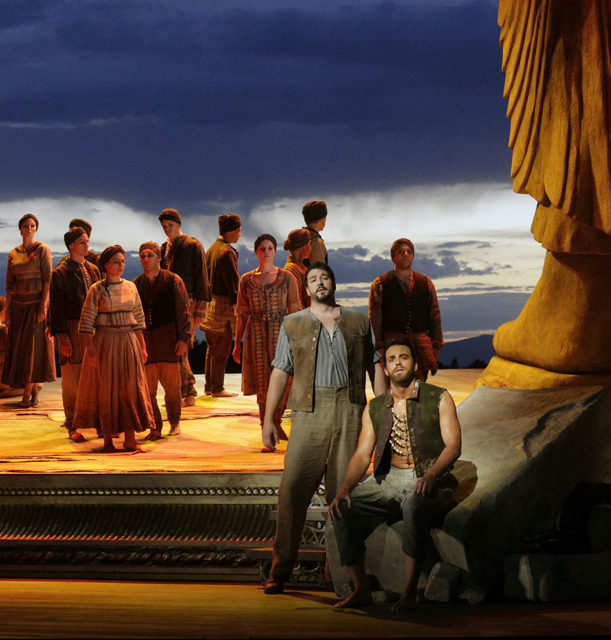 For complete schedule and ticket information, visit Santa Fe Opera.